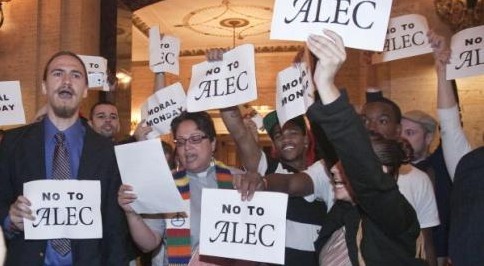 ALEC begins their 3 day nationwide meeting today, Wednesday the 4th. All of the big deals in the GOP will be there — including former VP candidate Rep. Paul Ryan (R-WI) and Senator Ted Shutdown Cruz (R-TX). The American Legislative Exchange Council (ALEC), which claims it does not lobby even though it creates model legislation that its Republican legislative members like John Boehner and Paul Ryan then implement, is concerned about being investigated by the IRS for their charitable tax status claims, according to internal documents from ALEC published by The Guardian. The documents seen by the Guardian show that Alec is hoping to avoid legal, tax and ethical challenges by creating a separate sister organisation it calls the “Jeffersonian Project”. The new body would be categorised as a 501(c)(4) social welfare organisation, a designation that would allow Alec to be far more overt in its lobbying activities than its current charitable status as a 501(c)(3). After losing corporate donors who expressed a need to contribute to a tax exempt organization and concern over ALEC’s status, ALEC (with its 501(c)(3) charitable status) has set up a new 501(c)(4) entity, the “Jeffersonian Project”. It will be able to lobby to its hearts content. Included in the documents is a letter from their legal counsel advising that the main activities of the Jeffersonian Project must be devoted to the promotion of social welfare. They lay out that ALEC does not wish to be “perceived” as a lobbying group, and they do not wish to register as a lobbying group in any state. So for states with tougher standards, they will use the Project. Joe Stack, the Texas man who this morning, say law enforcement officials, flew a plane into an Austin building that houses a local IRS office, appears to be the author of a lengthy online screed, lashing out at the IRS, the federal government, and big corporations, and referring to his coming death. Stack’s Austin home was on fire this morning, at roughly the same time that he’s said to have crashed his plane, according to the Austin-American Statesman. Stack died in the crash, officials have confirmed. The paper adds that an IRS revenue collection agent who worked on the building’s second floor is missing, according to another revenue agent who worked in the building. The building, known as the Echelon 1 Building, houses about 190 IRS employees, according to a statement from the agency. The FAA has said the crash appears to be a “criminal act” and that the FBI would take the lead in investigating the incident. But federal officials have said they don’t consider the crash to be a terrorist attack, according to the New York Times. The communist creed: From each according to his ability, to each according to his need.The capitalist creed: From each according to his gullibility, to each according to his greed. The Devil Deals In Prada, Apple Jacks And Kidneys?? At 6am last Thursday, more than 200 FBI and IRS agents fanned out across the state of New Jersey, as part of that corruption and money-laundering probe that ended up netting 44 people, including mayors, rabbis, and a state lawmaker. Now that the dust has settled, it’s worth taking a look at the whole sprawling operation. The story (sub. req.) starts with a 36-year-old real-estate investor and philanthropist named Solomon Dwek. Dwek, a member of the tight-knit Syrian-Jewish community of Deal, New Jersey, used family connections — his father is a prominent local rabbi — to win investors’ trust and build a real-estate fortune whose value at one time approached $500 million. But at some point, Dwek appears to have taken out more loans than he could pay back. In 2006, in an effort to pay back his creditors, he allegedly deposited a $25 million check at PNC Bank, which was not backed by funds. He was charged with defrauding the bank out of $25 million.